PWI has always been eager to please our clients. Our greatest joy is when a client lets us know how pleased they were with their “papered wonder”. We consider it a pleasure to create custom designs and unique products and never do so with the intent to gain recognition. However, when our clients are pleased and we are recognized as a result, we count ourselves dually-blessed! 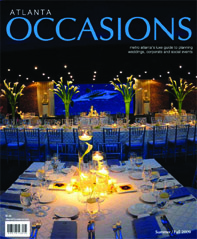 Such was the case in the premiere edition of Atlanta Occasions Magazine. The Publisher, Heather Vreeland, chose to feature one of our unique invitation designs as well as interview our CEO, Lisa, about stationery trends. We are pleased that Heather considers PWI ahead of the game and grateful for the exposure to brides across the Atlanta area and beyond. PWI is humbled by this special recognition and remains honored to serve. ← 8 Years of God's Favor!